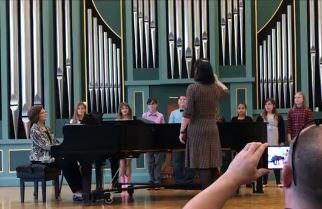 Pittsburg Memorial Auditorium & Convention Center’s Pittsburg Youth Chorale performed at Pittsburg State University’s Mid-America Music Festival on Saturday, April 13th and received a I (Excellent) Rating. The ensemble is under the direction of MJ Harper and accompanied by Virginia Darling. 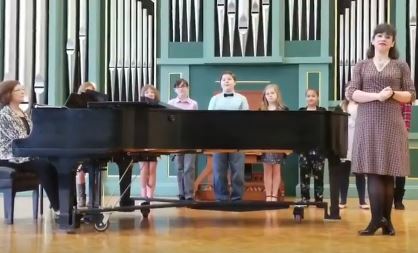 Members of the Pittsburg Youth Chorale are comprised of 4-6 grade vocalists from southeast Kansas, including Auggie Allison, Ben Bolinger, Gwen Crosetto, Eden Darling, Sydney Ewing, Lyric Jarvis, Chloe Riske, Andrea Wood, and Nia Imhoff. Participants will receive their Blue Ribbons and Certificates at their finale performance Tuesday, May 7th, 6 PM, at Memorial Auditorium & Convention Center. All are welcome to attend! For more information or to book this ensemble for performances, contact MJ Harper 620-719-6633 mjharper@usd234.org .